Egyptian President Abdel Fattah al-Sisi and Jordan’s King Abdullah II called on Sunday for the resumption of Palestinian-Israeli talks based on the two-state solution and the Arab Peace Initiative. The resumption of talks should aim at reaching a just and comprehensive settlement to the Palestinian issue that would protect the legitimate rights of the Palestinian people to establish an independent state on the 4 June 1967 borders with East Jerusalem as its capital, the two leaders said at a session of talks. 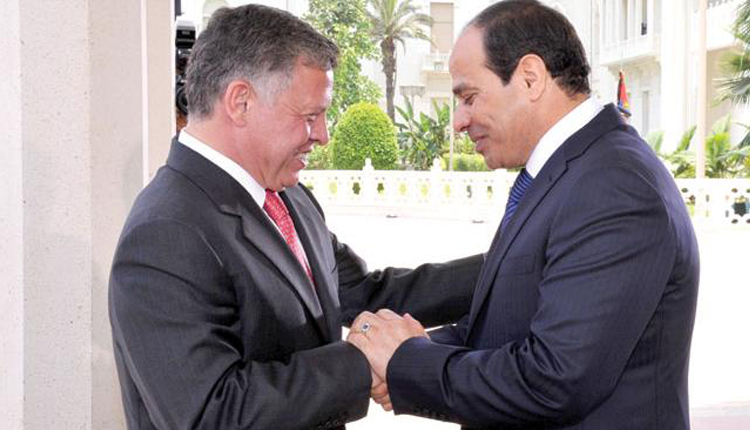 Upon arrival in Amman earlier in the day, Sisi had summit talks with the Jordanian king, followed by a session of talks involving the delegations of the two countries. The two sides discussed ways of boosting bilateral ties in the economic, trade, investment, pharmaceutical, transportation and energy fields as well as the export of natural gas from Egypt to Jordan. Sisi lauded during his talks with King Abdullah the special Egyptian-Jordanian relationship at the official and popular levels and affirmed Egypt’s interest in promoting it on all levels, Egyptian presidential spokesman Bassam Radi said.